Thorough: 68,000 words, 220 pages, 1520 references. Up to date: covers fiction, nonfiction and poetry submissions, plus traditional, e-book, PoD, Kindle, Amazon and internet publishing and self-publishing. Practical: exactly what you need to do at each step. Honest: how publishing operates, with insider information and internet surveys. To the point: summarizes each topic and adds sites for checks and research. If you really want to get that book or article published, this reference work may well prove a lifesaver. You'll have a map of the entire publishing world, traditional and contemporary, and will be able to choose the publishing or self-publishing route best suited to your time, talents and financial requirements.
.	Publishing is a strange if not mad world that combines superb professionalism with laughable incompetence.
.	Over half of books bought aren't read.
. The odd best-seller aside, no one today makes serious money at publishing, either authors or publishers.
.	Because many publishers are struggling to survive, the last thing they want is another manuscript from an unproved author.
. If they're sensible, authors write to communicate, for a love of their subject, and (just possibly) some status.
. 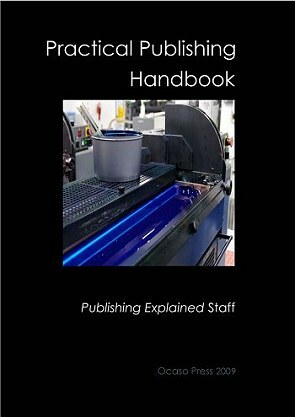 Anyone can publish a book today at modest expense, but even recouping the outlay needs effort and much inside knowledge.
.	Electronic publishing and the internet are important developments, but bring their own needs: just creating an e-book and setting up a marketing website will not generally work. Some talent is needed, but equally important is an understanding of the publishing business, persistence and a grasp of the opportunities. Most writers earn far more from reviewing, teaching, adjudicating competitions, giving talks, running workshops, and/or appearing on radio than from royalties on their publications. Thirty years ago, some 70,000 new books were published each year in Britain, of which 6,000 were novels. Twenty percent of these had some claim to literary respectability. There were big-earners, multimillionaires even, but only 300 full-time novelists made over £8,000 p.a., with another 300 supplementing income from journalism, and another 900 supplementing income from some other literary activity. Figures from other countries were equally depressing (e.g. 1250, 750 and 1750 respectively for the States), and these will not have improved recently. Rebecca Brandywyne spoke for many when she remarked: 'the hard reality is that the vast majority of authors cannot earn even a comfortable-much less a luxurious-living from their writing careers, and, unless they have access to other sources of funding (such as a working spouse, investments and dividends, or an inheritance), are frequently compelled to take other jobs as their primary means of financial support.' She provided a worked example. Consider a mass-market paperback book of 25,000 copies printed, an average return rate of 50%, an average $6.50 cover price, and an average 6% royalty rate. Royalties would amount to $4,875, less agent fees of $731.25, leaving the author a before-tax profit of $4,143.75. How long it takes to write a decent novel depends on the genre, the quality, and what you call writing. Kerouac's 'On the Road' was dashed off in three weeks, but Joyce's 'Ulysses' took sixteen years. The actual typing may only require a few months, but the ideas generally take years to gestate, and that first draft will need extensive rewriting and sometimes a whole new storyline. Many novels never come good, and have to be abandoned-providing valuable experience but not, as Bernard Shaw remarked, worth quite what we've had to pay for it. Most novelists report a year or two of actual writing. Best-selling novelists can afford a more leisurely pace, turning out a blockbuster every three or four years. Some novels are written in weeks, either under inspiration or by relentless application, but that rate can't be maintained for long. The respected UK Society of Authors found half their members earned less than the minimum wage, and successful authors urge newcomers to look before leaping into full-time writing. Any large UK publisher will receive 2000 unsolicited novel manuscripts in a year, and publish 20. The average serious first novel receives half a dozen reviews and perhaps sells 1000 copies over two years. With royalties around 10% at best, writers must learn to mechanically turn out a commercial product or starve. Seventy-five per cent of serious writers in the States earn no money at all from their work, ever. Don't believe this? Use titlez, ranktracer and rankforest to check sales on Amazon, or just glance at the sales ranking. A respectable ranking of 10,000 indicates sales of 100 books per month, perhaps earning their proud authors $1 a sale. Read an insider's view of the publishing trade by Michael Allen, or look at matters from an enterprising publisher's point of view. Consider the work that internationally known poets put on their sites (we're not naming names), and ask not why it's so indifferent but how they ever got round to writing the pieces in the first place, given the unending schedule of talks, signings, representation on various societies, weekly column, and contributions to late-night shows where they must say something kindly about the books of colleagues they haven't read and don't intend to. Literature does not bring fame. Its standard-bearers were the English departments in schools and universities, but these have been taken over by critical theory, which often lacks humanity and the honesty of clear exposition. Work in the small presses is very mixed, and few have a circulation above the low hundreds. Even the habit of close attention soon wears off, as 58% of US high school students and 42% of college students never open a book after finishing their education. Print on Demand companies estimate that one million manuscripts are looking for a publisher in the States alone, of which only one per cent will be successful. Read the book if you want to shorten the odds.